Each unique flag in a county represents one or more companies from the same parent country according to 2017 data. Dassault-Falcon Jet Corp. (business jets), Safran (aerospace and defense components), bioMérieux (diagnostics for health sciences) and L'Oréal (cosmetics) have two things in common. They are headquartered in France, and they have operations in Arkansas. Other French companies have facilities in the state, too, which combined have created 3,306 jobs. That's just France. Arkansas is home to nearly 470 global employers that support more than 34,104 jobs including: Unilever and Tate & Lyle (United Kingdom); Hino Manufacturing USA, Kagome USA and Nidec (Japan); Infosys Technologies Ltd. (India); Syngenta (China); and ABB and Nestlé (Switzerland). "The greatest advantage Arkansas has for attracting international companies is its customer service," said Mark Hamer, International Business Development Director at the Arkansas Economic Development Commission (AEDC). "We have had success with companies from Europe and Asia due to our responsiveness to the needs of companies." Among other things, that means uncomplicated access to state and other officials for project discussions. "European companies, in particular, require lots of details (about taxes, incentives, labor shed, wages and so forth) in order to assess a location as a potential site for a manufacturing facility and to feel comfortable making an informed decision," Hamer added. "Asian companies tend to feel comfortable making an investment decision when they have built a strong relationship with people they can trust to be there to help them long term." Stockholm, Sweden-based Gränges is a global leader in aluminum engineering, manufacturing and innovation. In May 2018, it announced plans to restart production at its Newport, Arkansas, facility, which produces light-gauge aluminum foil for various consumer applications. The investment amounts to $26 million. "This is a good opportunity for us to upgrade and use the assets we already own and address an attractive market niche which has been mainly served through imports," said CEO Johan Menckel. The facility produced aluminum foil for consumer applications until 2015 and has subsequently been idle. The facility was part of Noranda's rolled aluminum business, which Gränges acquired in 2016. Hefei Risever Machinery Co. Ltd., based in China, is building a new manufacturing plant in Jonesboro, in the Craighead Technology Park. It is Risever's first to be built in the United States. Risever makes machine parts for heavy equipment for manufacturers like Caterpillar, Volvo and Komatsu. The company spent more than a year investigating possible sites, beginning with 70 cities in five states before choosing Jonesboro. In the next five years, Risever plans to invest $20 million to create 130 new jobs in Jonesboro. The facility will target an annual production capacity of 18,000 tons of steel. In May 2017, Shandong Ruyi Technology Group (Ruyi) announced a $410-million investment in the former Sanyo manufacturing facility in Forrest City. Ruyi, headquartered in Shandong Province, China, will create up to 800 new jobs at the facility, where Arkansas cotton will be spun into yarn for textile use. This is Ruyi's first facility to locate in North America. "Ruyi Group, as the largest textile manufacturer in China, has been expanding globally," said Chairman Yafu Qiu. "Our manufacturing facility in Arkansas will become the first milestone of Ruyi's steps into the United States. We are dedicated to provide the product with cutting edge technology and superior quality." Ruyi's renovations on the former Sanyo building began in late 2017. The Sanyo facility had been vacant since late 2007 when the company shut down production in Forrest City. Ruyi plans on processing more than 200,000 tons of Arkansas cotton annually at the Forrest City facility. Arkansas is the fifth largest cotton producer among all states, producing more than 1.1 million bales in 2017. "When looking to expand into North America, world-class international companies continue to choose Arkansas," said AEDC Executive Director Mike Preston. "The hundreds of jobs to be created by Ruyi will have an economic impact beyond eastern Arkansas into the entire state. Their commitment is further proof of Arkansas' international momentum." 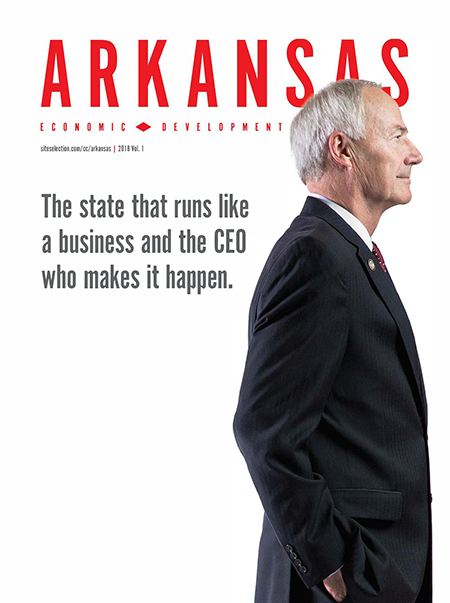 Arkansas' governor runs his state like a business. And business is good.